One of my New Year’s resolutions is to study the book of Deuteronomy. If I break all of the other things that I have on my list (which exists in my mind, not on paper by the way) I really want to see this one through. As I have grown in my social justice awareness, if you will, Deuteronomy has increasingly become one of the most important texts that I lean on and come back to. In this book I find a prescription of what a community, or nation, is supposed to look like. It outlines how people are to be treated, and how those who have little resources are to be looked after and provided for. In this community, in fact, there are not supposed to be any poor. 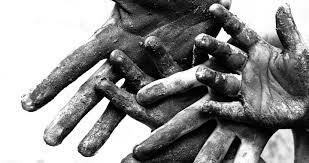 Poverty does not exist because people are not being exploited, manipulated or oppressed. Debts are cancelled. Land that could have been sold off to pay for debts is returned to the original owner. Slaves are released and not only are they released but they are given abundant resources for making a fresh start so that they do not end back up in servitude. The needs of orphan, the widow and the immigrant – or to those whom life happened – were also met. According to Peter Vogt, an OT professor at Bethel Seminary, they were not to be considered poor but rather people who due to their circumstances should be provided for differently. This wasn’t welfare or charity but rather the normal means by which the needs of vulnerable people were met. The parameters of economics and justice that Moses proposes are quite radical. It is an economic vision where the premise is oriented toward both serving and blessing others. Growth is not mentioned in this vision. The national GDP is not a thought in this vision. Surely financial blessings are a part of this vision but even then Deuteronomy makes clear that the blessings that flow into this community are to naturally flow out to others. What’s more, the blessings that come are not as a result of exploiting others. Yet, from the time that the Israelites entered into the Promised Land in Joshua 6 until they were taken into exile, they failed to live up to this standard of justice that God had prescribed. They were not the least bit concerned about the poor. In fact, in many cases those in power regularly usurped resources from those with little to add to their heaps of growing wealth and prosperity. Understanding that God’s vision was not carried out in the Old Testament, and surely has not been fulfilled to date, I believe that we should consider how our society is supposed to make sense of this text in our present reality. Clearly it has aims that are quite ambitious, perhaps even nonsensical. Still, there is something strangely compelling about this economic system that God has in mind especially when we compare it to how our economy is driven today. Today the economy in the United States is market driven. It is thrives on capitalism, in fact, this is the only way that it functions. A handful of people at the top, economically speaking, control and hold most of the wealth in this nation and this is okay (so the argument goes) because these are the people who are stimulating the economy, buying goods, and creating jobs for the remainder of the population. Since growth is the nation’s guiding principle, it is perfectly legit to do whatever it takes to get that growth even if it means exploiting others. Capitalism has created a permanent underclass for the sake of the people at the top. Since the nation’s inception, that class has largely been determined by race meaning that if you were a person of color, you were more than likely to be poor and underresourced. However, the recession has pulled the blinders off of the middle class myth, showing us the unsustainability of propping up a lifestyle built on credit, so that we see more white people a part of this class as well. 5 years after the start of the recession, we still have high levels of unemployment, foreclosure, homelessness, food insecurity and so much more. Even so, food assistance programs have taken a deep cut and extended unemployment benefits have expired. Ironically, or perhaps not so much, the nation’s defense budget is just as large and powerful as it ever was and top level executives and CEOs are still making bank. Where is the room for justice? Where is the room for the economic vision that God outlined for the people of Israel which surely have implications for us today? Because capitalism is the nation’s god, the fact of the matter is that there is no room. Economic justice and caring for vulnerable populations in the way that God envisioned is simply not feasible in a nation that cares more about the bottom line than anything else. If Deuteronomy is the standard, and God is serious when He says that ‘There shall be no poor among you,’ then we are way off the mark. Capitalism and economic growth cannot be our aim when God has made it perfectly clear that He is most concerned about the way we treat one another and provide for each other’s needs. While we might never see the totality of what God has in mind on this side of eternity, we should be growing into this vision as we become more and more like our savior and put to death the sin nature. The sin nature is obsessed with wealth and money; frankly these aspirations have no business being present in the life of a believer. In truth, we may not be able to change the way the society functions. We may not be able to challenge the country’s economic system and prescribe a whole new way of doing things based off of what Deuteronomy outlines mostly because this is not nation that is oriented towards the ways of the Lord. However, as believers, we can change the way that we operate in it. Understanding that capitalism is not the way, we can denounce it and instead operate in such a way that our lives are oriented toward serving and loving others. We can cast off our own obsession with the American Dream and instead adopt a new dream, a Deuteronomic dream that looks toward a day where there truly are no poor among us.